This book is a celebration of our most easily recognised and distinctive trees - their place in the natural world, their importance to Maori, their place in the world of symbolism, art, design, horticulture, and as a national symbol. It also looks at the mysterious disease called 'sudden decline syndrome', which has caused widespread losses of cabbage trees, and research to combat the problem. Lavishly designed, the book features numerous illustrations ranging from the author's magnificent colour photographs to reproductions of the tree in art, sculpture, and popular culture. 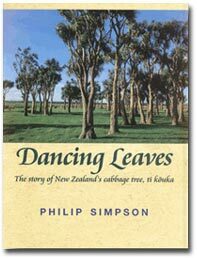 It also looks at conservation, the future of cabbage trees in the New Zealand landscape, and examples of cabbage trees notable for their great size or their particular significance in the Maori world, as well as trees planted to mark significant events or locations. Philip Simpson is a former Department of Conservation botanist. His interest in cabbage trees spans more than 20 years, including work to investigate widespread deaths of the trees since the 1980s. This book was written during a Stout Fellowship at Victoria University.